Finally! Fema is emptied out, cleaned up, and ready for her new owner. We’ve taken waaaay too much stuff out of her and jammed it into the Fireball, which is now groaning under the additional load. Every cranny has something shoved in there – we’re going to need a major sorting out of stuff when we get to Vegas. But, after spending just so much time sorting and cleaning, we’re antsy to hit the road, so we just stuffed it . There’s always tomorrow for fixing it, right? We had decided to split the 430 miles to Vegas into two days. 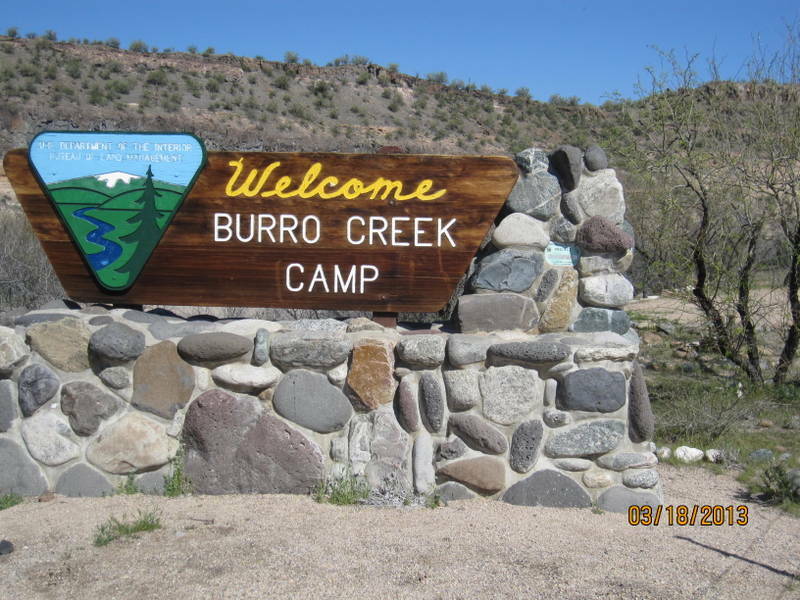 For Day 1, we decided to aim for Burro Creek Campground in Wikieup, AZ. 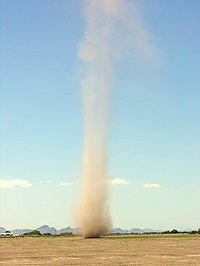 One of the first amazing things on the trip were a couple of dust devils, kind of like a ground tornado of dirt. We could see these from a couple of miles away, and I tried to snap a photo (unsuccessfully) from the truck window as we passed. But, for those who have never seen one, I borrowed a photo. They’re crazy to see, and the two out in the desert today were enormous and moving pretty quickly. Reminded me of the time two years ago when Caroline and I were cycling in Green Valley, and we saw a smallish one approaching the road, traveling at a speed that would intersect our path. We wisely decided to stop and let it cross ahead of us. When it hit the wide paved area, it quickly dissipated. The desert is a strange place. Phoenix was a mess to get thru, and we were very ready to arrive at our campground when we finally pulled in around 4pm. This is the first time we’ve camped in a BLM (Bureau of Land Management) campground – federal land. What a great spot! We were down in a canyon with actual water in Burro Creek. Shouldn’t be so unusual, but it is. With our National Parks pass, the cost for a night of camping is $7. No electric or water hookups, and no showers, but reasonably clean bathrooms and awesome vistas. We even had our own saguaro on site. Nice campsite with a covered picnic table. Here are a few more photos. Click to enlarge. After exploring on Monday morning, we packed up – Vegas, here we come. We’re parked at my sister’s house for a few days of hanging out and cooking in their ridiculously cool new outdoor kitchen. As I write this, we’ve got an enormous pork shoulder brinning – John’s plan is to cook it on the rotisserie with his signature rub. We’ve been waiting for this opportunity for months. More about cooking and eating in the next post. Best thing of the day? A shower!! Sounds weird, but this is the first shower I’ve had in nearly three months in a bathroom where I actually know the person who used the shower before me. As much as I love camping, I do miss a real bathroom. And, that’s probably enough about that subject. Second best thing? 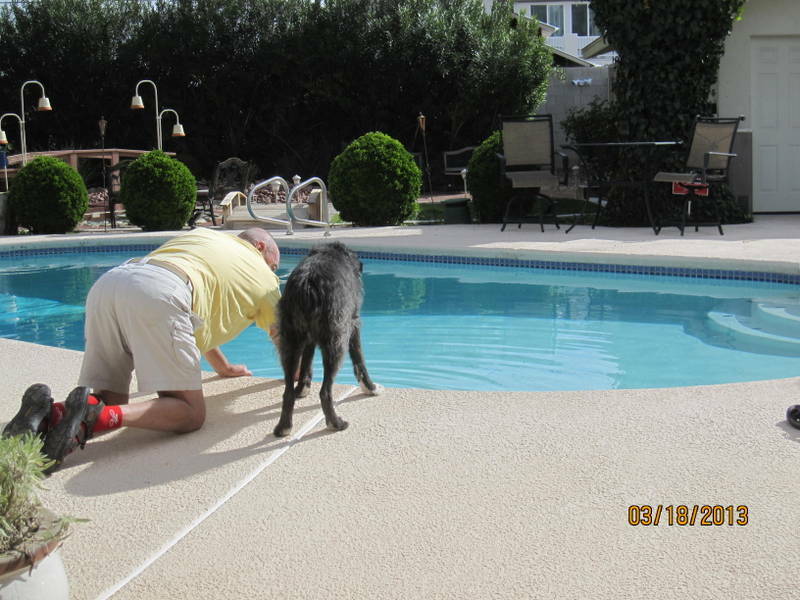 John trying to teach Jezzy how to drink from the pool. 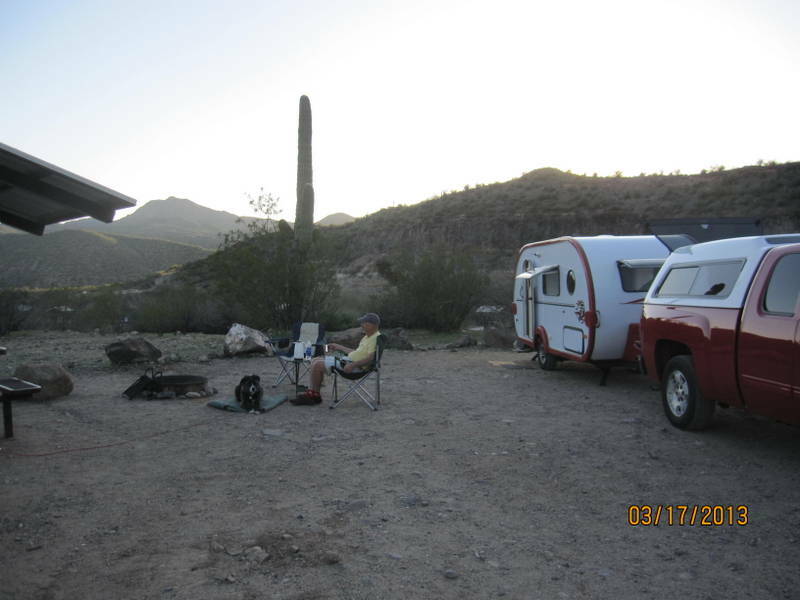 This entry was posted in family, food, RV life, simple camping, T@DA and tagged great food, retirement, road trip, simple camping, sisters, T@DA by Judy Crankshaw. Bookmark the permalink. The campsite is so odd to my Eastern eyes… but haunting. Enjoy the driveway camping. We think it beats any RV park! Actually, the Fireball is in the driveway, while we’re nestled inside with fluffy pillows and smooth sheets. The desert landscape takes some getting used to. Everything just seems bigger out here.